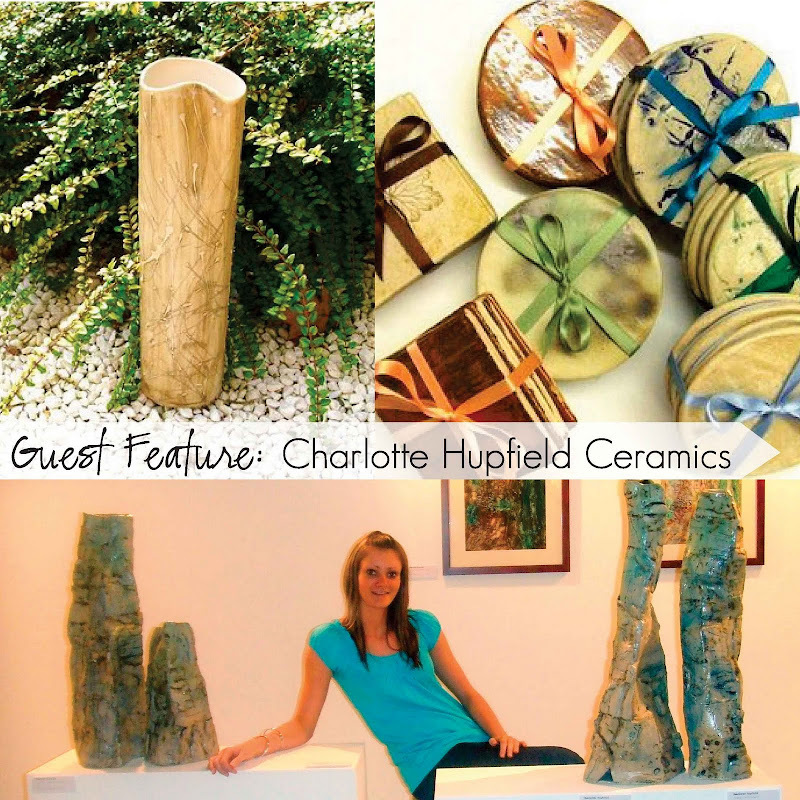 Happy April :) Today we have Charlotte of Charlotte Hupfield Ceramics in the UK. Welcome, Charlotte! Hello! My name is Charlotte Hupfield. I am a Ceramic Designer/Maker, living and making my work in Northamptonshire, UK. My passion is clay! I have a beautiful cat named Molly, I have a huge soft spot for anything earthy, natural & organic, I enjoy going for walks in the woods, I love to sit out in the garden on a summer evening chatting with a glass of wine, sunshine makes me smile. My favourite foods are pizza, roast chicken & marshmallows (although not all together! ), and I love trying tasty new recipes. 2. How long have you been creating things and what inspired you to begin creating things? It all started with my fascination with clay at school, which led me to develop my creative skills at college where I completed various A-Levels including 3D Design, Fine Art and Art & Design. This broad range of artistic skills and knowledge got me straight into university where I studied a BA (Hons) in Surface Decoration. I have always found surfaces, patterns, textures and colours the most visually appealing. 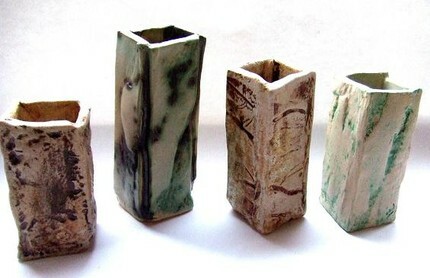 Throughout this 3 year course I specialised in ceramics and focused on developing my own style of work. 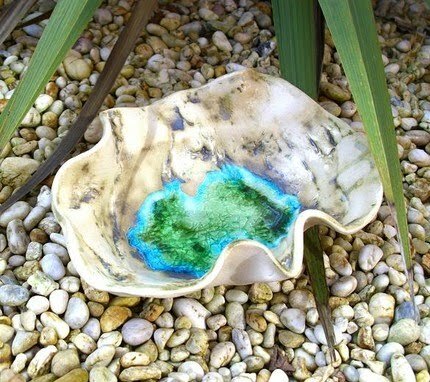 I have now been continuing to make and develop my work from my workshop in my garden for the past 2 years. 3. What is your shop name and what do you sell? 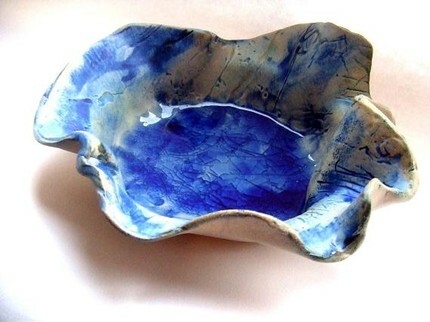 I sell a range of unique handmade ceramic items including vases, bowls, sculptural vessels, clocks, sets of coasters, wall plaques, letter racks, and smaller items such as magnets, brooches, buttons & paper weights. I’m always coming up with new items and designs. Each item is an individual one-of so no two pieces are ever the same. My main source of inspiration comes from the natural world and I hope this shines through in the style of my work. 4. How long have you been selling on etsy? I have been a member of etsy for about a year now, but only opened my shop a couple of months ago as I’ve been focusing on my UK shops Folksy, Swanky Maison, and my own direct website. I recently decided to branch out and offer my work worldwide. I’m still quite new to etsy and am still learning new things. 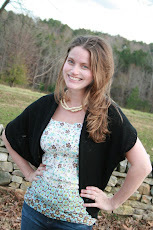 I’m pleased to have been featured in 2 treasuries so far. 5. Describe your creative process: How, when, materials, etc. After each session in my workshop, I often have a little tidy up (I’m quite organised! ), and prepare the work surfaces for the next time I’m out there. I also get all the necessary tools out ready, and sometimes pin notes up on the wall to remind me what I need to be working on. I enjoy every little moment that is spent in my workshop, I like to think of it as a place where I sometimes go to hide out from the rest of the world. I am in my own little world when I am creating. I like to listen to the radio and some of my favourite CD’s whilst working, it keeps me moving. 6. Do you promote your shop? How? I usually post links to some of my new items on Twitter, as well as in the etsy forums, although I find it quite difficult to keep up with things in there! I also have a ‘mini etsy’ displayed on my blog with selected items on show, and I have a link to my shop in my signature on other craft related forums. 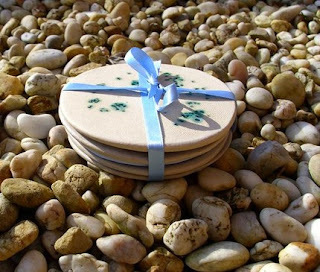 I send business cards and leaflets with every sale that I make, which are also available for people to help themselves on my stall at craft fairs. I am thinking of having a large sticker promoting my work and my shops in a window of my car! 7. Do you sell your items anywhere else (such as boutiques, craft fairs, etc)? Where? Aside from my online shops, I enjoy going to craft fairs and other events to sell my work. I attend a wide mix of events such as specialised craft-only fairs & markets, craft & country shows in outdoor marquees, balloon festivals, and events at different indoor venues. Some of the outdoor events that take place over more than one day are treated as mini holidays because we camp on site during the show, it’s a really fun experience! There are 4 galleries throughout the UK where I sell my ceramics, and I am always on the lookout for new potential stockists. I also take part in exhibitions, I had my first solo exhibition in a local gallery last year and really enjoyed setting up my display. 8. What keeps your creative juices flowing? How or what are you inspired by? I’m inspired by everything natural - especially close up surfaces such as tree bark, rocks, and plants. I like to photograph these types of things whilst out walking, I’ve always got my camera with me! Whilst concealed amongst these natural surroundings in the landscape, I feel relaxed and at home. I find it amazing to see the changes in rocks and coves caused by weathering and erosion from the sea, bumpy and colourful linear patterns found within fields and hills, and the surfaces in nature where no two marks are ever the same – it is this particular aspect that my ceramics connects to. 9. When you hit a creative wall (not feeling like creating, or what to create, etc) how do you get your creative juices flowing again? If I’m ever feeling stuck for inspiration (which does happen from time to time), I dig out a book I own called Sources of Inspiration by Carolyn Genders and have a good flick through it. This book guarantees to get the creative juices flowing again! 10. What challenges do you sometimes face when creating? The weather plays a big part of my creating, and sometimes causes problems. 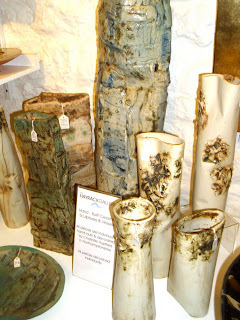 I make all of my work from my workshop in my garden, which can either get very hot or very cold! In the summer I have to be careful that the clay does not dry out too quickly, whereas in the winter it sometimes freezes! The drying process of clay is important, it shouldn’t dry out too quickly as this can cause cracking during later stages such as firing. Sometimes I have to bring work into the house to dry during the winter because it takes too long to dry properly in the workshop; the kitchen cupboards get full of items drying in different stages! 11. What goals do you have for your shop? 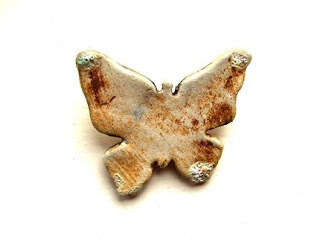 I have lots of new pieces in the kiln as I write - some experiments, and some development pieces. There is a queue forming for more new work to be finished and fired, so once I have assessed the results and photographed each piece, they will gradually be listed over the next few weeks. In terms of a goal for my shop, I would be happy to make a sale to a customer in a different country as I have never sold a piece of work to anyone outside of the UK as yet! 12. What advice would you give to someone who is new to selling on etsy? I don’t feel confident enough to give my own advice as I’m still new to etsy myself, but a few things I have learned from other sellers are to list items gradually, i.e. one item every day/couple of days instead of 10 items all in one day to gain extra exposure. Include a range of different priced items in your shop, and make sure your photographs are of a high standard. 13. Where do you see yourself in 5 years? 14. Do you have a blog? 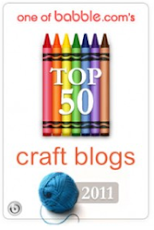 What a great blog - so happy to find new inspiration. Wow, what style. I also love your own etsy shop, especially the paper pack. So lovely. Great interview! I love the cherry and chocolate coasters in Charlotte's shop. Great interview, nice stuff. I really like it :)!